PUEBLO –International Artists Nastja Säde Rönkkö and Luke Turner will exhibit and discuss their collaborative projects at the Fine Art Gallery at Colorado State University-Pueblo from January 18-29. All events are open to the public at no charge. Rönkkö & Turner are best known for collaborating with Shia LaBeouf, who as an actor played key roles in the films Fury, Disturbia, and the first three blockbuster Transformers films. At its core, their collaboration explores the nature of empathy, identity, and vulnerability, amplified by the particulars of an individual under constant public gaze. From January 18-29, the CSU-Pueblo Fine Art Gallery will exhibit the artists’ work Monday through Fridays from 10:30 a.m.-4 p.m. Rönkkö & Turner will present a public lecture from 5-6:30 p.m. on Friday, January 22 in the Library and Academic Resources Center 109. Assistant Professor of Philosophy Dr. Andrew J. Corsa will discuss the artists’ work in relation to philosophical problems concerning authorship and group cognition from 6-7:30 p.m. on Tuesday, January 26 in the Library Academic Resources Center 109. Rönkkö & Turner will participate in a public reception at the Fine Art Gallery from 5-7 p.m. on Thursday, January 28. In addition to the public presentations, the artists will visit classes across the disciplines, including art courses, where students will collaboratively produce artwork based on ideas discussed in the artists’ lecture and discussions. Later, students in English courses will write about the art students’ collaborative work. The artists also will visit philosophy courses, where students will be introduced to the philosophy of art and how it is relevant to contemporary art. Caroline Peters, Associate Professor of Art, said the events will give students, many of whom have not traveled extensively, exposure to provocative ideas that are the central focus in international, contemporary art museums. Corsa’s lecture will focus on how the artists’ work relates to several major questions from the philosophy of art and aesthetics. Program. The events also received a generous grant from CSU-Pueblo’s Maestro Program, which seeks to broaden the scope of “hands on” teaching and learning, and help students to achieve success through academic initiatives and critical thinking across disciplines. The artists describe their work as engaging with the "gap between the idea and image of a projection of a public persona and an understanding that this person is also a real human being." 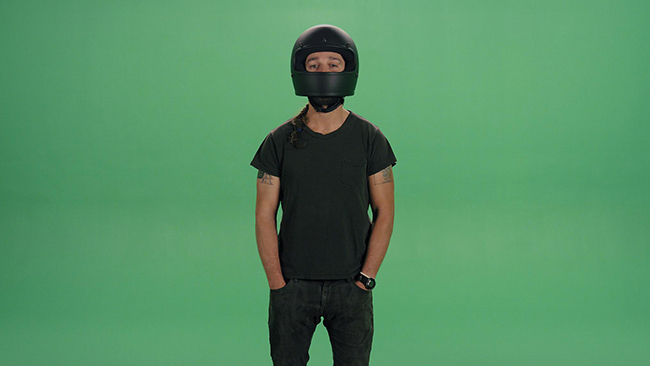 In one of the artists’ many artistic collaborations, titled #INTRODUCTIONS, the three artists asked art students at Central Saint Martins to write short, minute-long scripts for LaBeouf to perform in front of a green screen, and encouraged the students to subsequently fill the green screen with whatever images they saw fit. A short excerpt of this video, called the Shia LaBeouf "Motivational Speech" went viral on YouTube with millions of views, and has been re-mixed by YouTubers in hundreds of ways. The artists' collaborative practice takes the form of a series of performances and interventions within and surrounding the social networks, the mainstream media, and the art world. Through a multi-disciplinary hivemind approach, their practice explores questions of authenticity, public persona, and engagement in the internet age. The artists argue that this is reflective of a cultural shift away from the ironic, cynical modes of late postmodern culture, in favor of a performative turn towards notions of sincerity, affect, and truth, reflective of a structure of feeling that has come to be called metamodernism. The Fine Art Gallery exhibition will feature artifacts from, and film recordings of, a number of their performances and interventions. In one of their most recent projects, titled #TOUCHMYSOUL, the three artists posted a phone number prior to the event, and then took calls from whoever dialed, seeking human connection through art and technology. Each artist began each conversation with the lines: "You have reached LaBeouf, Rönkkö & Turner. Can you touch my soul?" The performance culminated in Rönkkö tattooing the words "You. Now. Wow." onto LaBeouf's arm – a quote taken from one of the calls, fittingly embodying the indelible marks of connection and community that were made over the four days of the project. Luke Turner, based in the U.K., has a B.A. in Fine Art from Central Saint Martins and an M.A. in Photography from the Royal College of Art. He is the co-editor of the aesthetics and culture website Notes on Metamodernism, and in 2011 published the Metamodernist Manifesto. Nastja Säde Rönkkö, based in Finland, studied fine art at Central Saint Martins and the Slade School of Fine Art. She works mainly with performance, video, and installation, and her recent shows include 'Mum' at Mother’s Tongue Festival Helsinki, and 'Club' 27 at Kiasma Museum of Contemporary Art.